Just when you think President Barack Obama is out for the count he always comes back with a brilliant move from his political playbook. He has taken a lot of heat since the BP oil spill about not turning this environmental disaster into a golden opportunity to tout a transition to a clean energy economy. Some of the criticism has been justified as it has seemed like Obama has not been paying the same amount of attention to the Kerry-Lieberman American Power Act as he did to Health Care Reform or even now with Financial Reform. 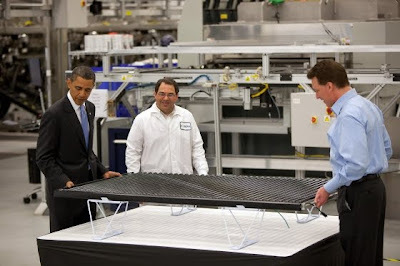 However, perhaps the president is getting the message as Wednesday he visited solar panel manufacturer Solyndra. Inc. in Fremont, California before heading to Louisiana for a second time to assess the progress in cleaning up the massive oil spill. "But even as we are dealing with this immediate crisis, we’ve got to remember that the risks our current dependence on oil holds for our environment and our coastal communities is not the only cost involved in our dependence on these fossil fuels. Around the world, from China to Germany, our competitors are waging a historic effort to lead in developing new energy technologies. There are factories like this being built in China, factories like this being built in Germany. Nobody is playing for second place. These countries recognize that the nation that leads the clean energy economy is likely to lead the global economy. And if we fail to recognize that same imperative, we risk falling behind."